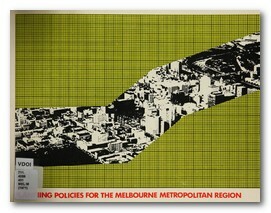 Published in 1971, Planning Policies for the Melbourne Metropolitan Region took the first comprehensive look at the constraints that surrounded Melbourne. This report introduced long-term conservation and development policies through growth corridor and what we now call 'green wedge' principles, and contains outward growth to a limited number of areas on the edge of the city. "The published plans are the first step towards making the most of efficient and compatible use of land available, channeling urban development into growth corridors within easy reach of open areas, making the best use of our existing systems, conserving our resources, preserving areas for the future and developing in a way that minimise future community costs."